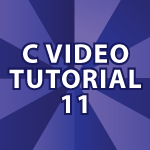 In this part of the C Video Tutorial I will provide C File IO examples. I’ll cover C Text File IO in this tutorial and the Binary File IO functions in the next part. I specifically cover the following topics: FILE Data type, fopen(), fputs(), fseek(), ftell(), fgets(), fclose(), fscanf(), puts(), fprintf(), Different Ways to Access Files, and more. All of the code used is available below the video. // but the C compiler acts as if it is in sequence. // Opens a text file so we can write data to it. // characters per lines read. // Puts outputs the string plus a newline. Thank you for the tutorials in C! I enjoyed your Java lessons – they helped me quite a bit in school. I am now taking a Discrete Structures course where I must implement assignments in the C programming language and was pleasantly surprised to find these videos from a trusted source. In the commented section of the first main function, I notice it states that fopen() returns a ‘1’ if it is unsuccessful. Is this correct? Other sources state that it returns NULL or a ‘0’ if it is unsuccessful.